The West was the best for me, going a perfect four for four in the first round with an exacta in Chicago and THE upset special in Anaheim. I can only hope the second round for me in the west will be just as prosperous. 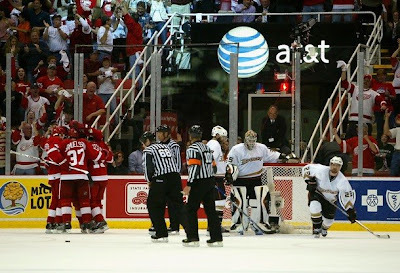 The Red Wings made short work of the playoff virgins in Columbus, but they did have a scare in Game Four. The old Chris Osgood showed up to the rink and it makes you wonder if that will be the goalie who shows up for the rest of the playoffs. Luckily, Johan Franzen is back in second season scoring form, while Dan Cleary has been the unlikely second banana on the Wings. We have yet to see the best out of Henrik Zetterberg and Pavel Datsyuk, but many hope it comes soon before it's too late. After a huge upset, the Ducks are going to be flying high-- to do a little wordplay here. 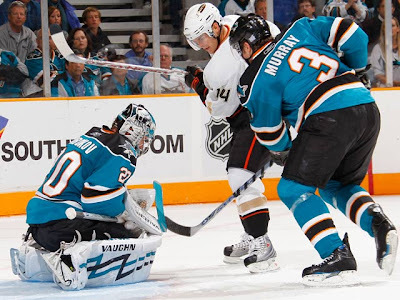 Jonas Hiller has stolen the top-slot in net from J-S Giguere and played the big dog role for the Ducks, keeping them in the game. 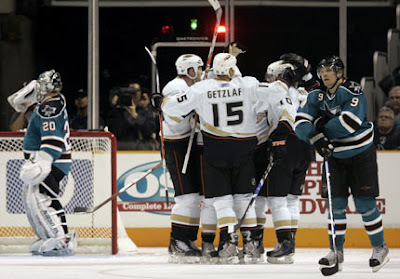 Chris Pronger has been defensively sound and kept his elbows down as Ryan Getzlaf has been the offensively leader, while mixing it up a bit here and there. With the upset boosting their confidence, you can only imagine what the Ducks could do as an 8-seed. PREDICITION: This will all be dependent on what Chris Osgood shows up, but I think the lack of slip ups against a hungry team in three of the four games, the Red Wings will have the edge in this. While Hiller has been good, he hasn't had to face someone like Tomas Holmstrom to annoy him in front of the net. Wings in six. There's a reason why Roberto Luongo is the captain of the Canucks and his numbers are speaking for themselves. Luongo has been nothing less than spectacular, which has help with the defensive minded Canucks. While the Sedins have played well and been the offensive catalyst; more depth will be needed in order to go further in these playoffs and in order to be a success. 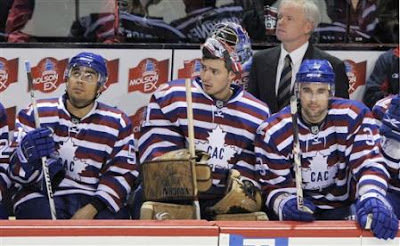 There's only so much Luongo can do to keep the Canucks in it. After seven years, the Hawks came back into the playoffs with a vengence against the Flames. The Hawks youth were able to show their aggression and never-give-up mantra in order to overcome some deficits and to have the killer instinct to not take a lead for granted that has happened to others in this playoffs. What was really shocking is role guys like Kris Versteeg, Cam Barker, and Brent Seabrook putting up the big points they have been. PREDICTION: While the Canucks are the last Canadian team in it, you can't go against the energy of the Hawks this playoffs. These kids have something to prove and could make it 2-for-2 when it comes to beating Canadian teams, but it goes the distance. Hawks in seven. So, after the first round, I'm licking my wounds for the from the predictions. I only went one out of four in the East, but the one was an exacta with Washington in seven. But, it's a clean slate and now we look at what's going to happen in the East and who could march into the Conference finals. The Bruins made easy work of the Montreal Canadiens and seem to be the dominant force in the East with the ease they were able to take out the Habs. Tim Thomas was solid in net and continued on his stellar play from the regular season. The question now is will there be a lot of rust on the Bruins with a week-plus layoff between games. While the rest will be much appreciated, it could catch the Bs off-guard on a team like the Canes who are in fresher game-shape and hungrier to prove themselves off the hop. The Hurricanes had a shocking Game Seven win over the Devils and seem to have a swagger that is reminisent of that in 2006 when they won the Stanley Cup. The Canes' best players have showed up to play, with Eric Staal coming through in the clutch and Cam Ward playing solidly when called upon. With the role players like Tim Gleason and Jussi Jokinen coming up big in key times, the Canes are wiley team that could be very underestimated through these playoffs. PREDICITION: As gritty and tough as the Canes were against the Devils, the Bruins will probably be too much for them. The Bruins have all the things going for them and have been getting energy from the whole roster, top to bottom. As much as the Canes will scratch and claw to get ahead, it will do little to advance-- but I think they will steal a game at home. Bruins in five. This is the match-up the NHL has been waiting for. This is the main event in the second round and will prove if the NHL is able to market their product with the two biggest names in the NHL and if they can't-- the whole marketing department of the NHL needs to be fired and ship to some remote island to die. Anyway, the Capitals are coming off a tough series against the Rangers, which they weren't able to display their offense because of the stingy Rangers defensive play and goaltending. However, when they were able to find the niche for the net, they came in droves and showed why they should have dominated the series. Coupled with the emergence of Simeon Varlamov-- the Caps have a new life in the second round. The Penguins had a great series against the Flyers, where they were able to comeback from some deficits during the series. However, the vaunted offense hasn't been as coming up big as many had thought it would. Averaging only three goals a game, the big play from M-A Fleury has been the helping factor for the lack of high-paced offense that the Penguins had hoped for in the playoff situation. PREDICITION: The Capitals will go up three game to one like they always do the the Penguins. The Penguins will win Game Five....and the Caps will close it out in Pittsburgh. So long as the Caps can stay out of the penalty box and shut down the top line, they should do just fine against their rivals. Caps in six. A season of surprises, including the last minute of Game Seven, have come for the Devils this season and now the questions begin on what could have been and what they could have done in order to still be in the playoffs. First, the Devils learned they can win without Martin Brodeur in net, which should be fantastic to know since the Devils may want to see if they can get their superstar some rest from time to time. However, the question here is if Scott Clemmensen will price himself out of the back-up job because of how well he played this season. He could command a serious contract out on the open market if he went out there, but he would have the comfort of not having all the pressure and expectation on him if he stays with New Jersey. Decisions, decisions. 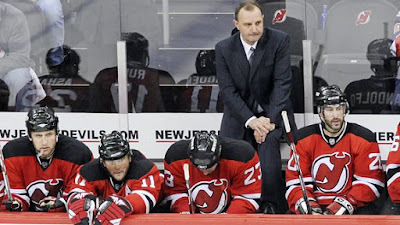 In Brodeur's absence, the offense was allow to jump to the forefront. Zach Parise made a big name for himself with a 45 goal campaign and 94 points on the season to lead the team in both. Patrik Elias was able to become a factor again for the offensive, while Jamie Langenbrunner and Travis Zajac were chipping in here and there. With Brodeur back full-time next season, it will be interesting to see if the offense will go back into a defensive shell or if they will allow to go all out like this past season. It'll be interesting to see what the Devils do with the contracts of John Madden, Brendan Shanahan, and Brian Gionta, as they are all UFAs this summer. The defense hasn't been as strong as it has from the Devils' past, but the consistency from Johnny Oduya, Paul Martin, and Mike Mottau, all whom were over +20 this season, has given the Devils a good core of lunch-pail defenseman who won't be overly flashy, but will get the job done. Colin White was anchored the defense and had a solid season overall. Expect Oduya to get a nice contract re-up this summer and have him learn more for White and Martin to be the leader of the defense for years to come. While all the positives are from the regular season, something couldn't click with the playoffs, often coming down to late game collapses. Concentration will be something that will be worked on for the summer and playing all sixty minutes will be crucial to the success of the Devils going forward. With all the talent they possess, they could have done a lot more and gone a lot further than they did. If they want to be a Cup contender every year, they need to finally get past the first round-- which they haven't done for two post seasons. While they did collapse after taking a 3-1 series lead-- the New York Rangers did a lot more in the playoffs than many gave them credit for. However, their lack of offensive boost was ultimately what got them in trouble and what made them miss the second round of the playoffs. The Rangers were tied with the Lightning for 2nd to last in goals for in the regular season, with the Islanders coming in last. Only four teams as a whole had less goals than the Rangers, which should be a huge cause of concern for the Rangers heading into the off-season. There's plenty of RFA to sign, including Nik Zherdev, Brandon Dubinsky, Ryan Callahan, with Nik Antropov being a UFA. Whether or not any will be signed is to be seen, though Dubinsky and Callahan may be a lock, the Niks, not so much. They could use the room in order to get someone more offensive minded in there. Defensively, the Rangers need to be a lot better. Only Paul Mara finished the season on the plus side of the plus/minus docut, which shows you how awful all the others played, including the newest acquisition of last summer, Wade Redden-- or as the kids call him-- the albotross. And while Redden and Michal Rozsival provided some offensive spark, nothing is getting done in their own end, which is a killer to the team and leaves their goalie hung out to dry more often than not. Marc Staal still needs some seasoning about him, but he looks to be the shutdown guy for the Rangers, even at his young age. Henrik Lundqvist was the MVP and will continue to be that for the Rangers until they get some help for him offensively. He stole the games in the playoffs and was the thing to keep the Rangers in the playoff scenario game-in and game-out. Lundqvist should be suing for support for the Rangers, which should be interesting to see if GM Glen Sather will respond to that call or not. Granted, this will be the first off-season with John Tortorella as the head coach and it should be interesting which changes he would want to fine-tune in order to get the team that he wants and not just one he inherits. Also to see what he would want for his team in terms of system. Obviously, he'd love to see more scoring and would love to see his goalie get some help, but whether or not it's in the budget or not will be a different story. The Rangers had a roller-coaster ride of the a season-- going from great to crap to mediorce to get into the playoffs. Then in the playoffs, take a commanding lead in the series, but only to collapse due to their Achillies' heel of lack of offense and porous defense. There's going to be a lot of "what could have been" reminising in the New York media, but you wonder if they should be happy to have gotten there at all. How is Brashear's Hit Different From Stevens'?? 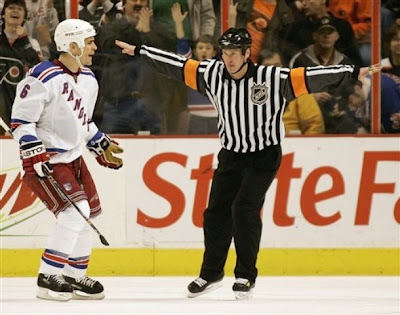 Everyone is making an uproar when it comes to the hit that Donald Brashear put on Blair Betts, for which Betts is done for the playoffs with a broken orbital bone and Brashear has been suspended for six games. Now, the fact of the matter is this-- the hit was late, the hit was a blindside, but I don't believe the hit to be dirty. Both of these hits had the elements of each other. First, Kariya and Betts were admiring their pass/dump-in respectively as they glided towards the middle. Stevens and Brashear saw this and saw the opportunity to hit and they did so. Both hits were late, both hits had the blind-side element to it, but only one got suspended. So, what was it about Brashear's hit that made it that much more brutal and made people get up in arms the way they have?? Was it because of Brashear's thuggish track record?? Well, yes-- that's probably why he got the harsh suspension the way he did. And for that, okay-- I can see that. Was it because Betts' got injured the way he did?? Again, most likely because if Betts didn't get severly injured, the suspension may have been less or non-existent from this. Yet, somehow-- while the hits were somewhat similar, Brashear's hit was apparently much more tumultuous than Stevens' was. While I don't agree with the decision, I can understand why is was made due to the past instances with Brashear. My issue with this all is that we shouldn't be praising and looking in awe over one hit, while condemning and saying how awful of a hit another one is when they are structurally the same thing. That's really all that needs to be said about the San Jose Sharks season after a first round exit in the playoffs. The best team in the league is now golfing and there's questions abound about what to for a team who is always inept when it comes to the playoffs. They have only once made it past the second round and always seem to have more to offer than what they have put up on the score sheet. There's one thought that the team needs to be blown up and started from scratch. One guy who was under the microscope and failed to perform was Joe Thornton, who seems to be destined for playoff failure. Thornton would have decent numbers for a second or third line grinder, but he has not put up more than a point-per-game in any of his playoff appearances. For someone with great stats in the regular season, you'd expect it to translate into the playoffs. 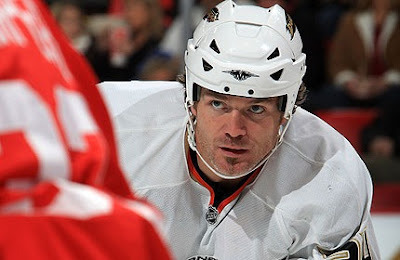 Another leader, Patrick Marleau, also failed to step up to the task and was a disappointment when the playoffs came around. Evgeni Nabokov is also another culprit to not stepping up to the task. A man who was so tough to beat in the regular season seemed to be full of holes in the post-season. I thought that Jonas Hiller was the Swiss one in that series. Nabokov should have been given the hook after game two and allow for Brian Boucher to take the reigns and see what he could do. Hindsight being what it is, it seems like a good idea looking back. Defensively, while Rob Blake and Dan Boyle were scoring, they forgot to play defensive as they were a combined -6, while the other defensemen were very non-existent when all was said and done. For a defense that was +35 for the season, you'd think they'd be a little more tighter when it comes to the most pinnacle time of the season. For a first-year coach, Todd McLellan did a great job to manage the team to the top-spot, but his inexperience showed when it came to the playoffs and nailing down a first round victory. Whether it was not able to outcoach his counterpart, Randy Carlyle or if it was just not being about to command the best out of his players when it counted the most, it didn't show off the greatness he was able to achieve while in the previous 82 games. There's only so many ways you can dissect the season for the Sharks and how much that they failed when it came to the post-season. This is a team that should have done a lot more with the talent they have in the line-up, but they could not live up to the task. Questions will be mounted from the top to the bottom of this organization and it could bring about mass changes or more of the status quo. However, something needs to be done in order to get this team over the hump and become the elite team they have hinted at for the longest time now. The Calgary Flames had a second half collapse which has led them to yet another early exit in the NHL Playoffs, this time to the hands of the Chicago Blackhawks. After being ahead of the Northwest Division for most of the season, they collapse from the trade deadline on and completely set a tone for disappointment in the playoffs. What needs to be done for the Flames, first and foremost, is to find out how to balance out their goaltending. Miikka Kiprusoff is a workhorse, but he seems to be wearing down after playing 70+ games a year. They either need to get a back-up who is experienced in playing a small amount of time and will not miss a beat in development or they need to gain more faith in their younger back-ups. While Curtis McElhinney isn't an awful goalie in general, the fact his development was stunted by sitting on the bench is why he's not a reliable option. The offense was better than the past few in terms of scoring, but some questions mark remain when it comes to who will be back. It seems the search for a #1 center for Jarome Iginla was solved when Olli Jokinen was acquired from the Phoenix Coyotes and he'll have another year in Calgary to flourish. With that, you can bet that Mike Cammalleri is expendable and probably won't be re-signed in Calgary. You have to wonder if Daymond Langkow will be shopped if possible to free up some room or if he'll stay along. The future of Todd Bertuzzi should be up in the air, as well-- especially after the disappointing playoff performance by him. After a late-season push, I expect Jamie Lundmark to get a small deal in the off-season to keep him in the system. The defense has seen better day. While Dion Phaneuf and Robyn Regehr are premier players, they seem to lose some kind of luster during the season, which hurt the defensive minded Flames made teams realize they can be beaten. With the play of Adam Pardy, you can expect that Adrian Aucoin will not be re-signed and Rhett Warrener will finally be done in Calgary after a injury filled tenure in Calgary. Whether or not they will make a play for Jordan Leopold or if they'll let another young guy jump into the fold. 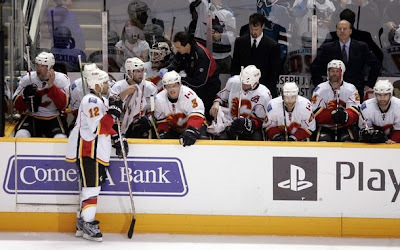 The Flames need a big confidence builder in the off-season in order for them to get off to a good start in the next season. However, the fans will not accept this loss easy and you can expect a big upraising to possible clean house in the front office and behind the bench. While Darryl Sutter has revitalized this team, there's only so much fans can take before enough is enough and they call for a change from the top down. Mike Keenan has done a decent job, but his words could have worn thin quickly with the Flames, thus the non-responsiveness of the club in the playoffs and another early exit. They can only go on their miracle run in 2004 for so long and the expiration date is now up for it. Calgary will need to come out in a big way next year, make the playoffs without a doubt, and then finally get past the first round of the playoffs to make people believe they are a contender for the year. A great team on paper only means so much when you can't translate that to the ice, the Flames are a prime example of that right now. One of the more highly anticipated awards at the NHL Awards is the Vezina for the best goalie in the league, for which the nominees were announced today. They are Minnesota's Niklas Backstrom, Columbus' Steve Mason, and Boston's Tim Thomas. People know about Mason and his year, and while his numbers as a rookie are beyond remarkable-- this year won't be his year; but he should be back again in this list for years to come. Nik Backstrom was a silent candidate, but his numbers put him in the top-5 in save percentage and goals-against average. However, both of those guys will only be seen on screen for these awards, because this one is going to go to Timmy Thomas. Thomas was more than stellar this season, topping the charts for goals against average and save percentage. While his wins weren't in the top five, his team was the tops in the Eastern Conference and he was a vital part of their success. Plus, the story of a guy who was stuck in the minor leagues, then trekking through Europe, finally landing a job in the NHL is one that will make people talk for years to come. If Thomas doesn't win this Vezina, I'll quit using dial-up; I swear to you, I'll go back to telegraphing this thing or I'll bring back the pony express to deliver my writings to all 10 of you. For a second-straight season, the Philadelphia Flyers were eliminated by their cross-state rivals, the Pittsburgh Penguins. It's much quicker than the Flyers had hoped, but now an off-season of uncertainty will loom with the Flyers and many question will be asked heading into next season. First off, the goaltending situation will be the first and foremost on the list for the Flyers. Both Martin Biron and Antero Niittymaki are unrestricted free agents and the question on whether or not to keep one or the other or both is going to be the big debate. The numbers for both this season were pretty close when you project Niittymaki's stats compared to Biron. The Flyers could have to concede and re-sign both of them, especially due to the fact that there is not much coming down the pipe in terms of free agents and it's better to go with the devil you know rather than the one you don't. Upfront, the Flyers were fairly solid with five players going over 50 points, and they were able to get back a healthy Simon Gagne, which definitely helped. The young guns in Mike Richards and Jeff Carter continued to show their maturity by going 1-2 in team points, while Scott Hartnell and his "Sideshow Bob" coif chipped in and gained a cult following in Philly. Mike Knuble is the only free agent for the front-line corp in Philly and could get re-signed if his asking price isn't too much and if the Flyers think they still need him around. One forward who would want a mulligan is Daniel Briere, who was out most of the season with various hernia and groin issues throughout the season. However, the blessing in disguise was the play of Claude Giroux. Giroux wasn't able to make a big offensive impact, but has the stats, skills, and ability to make himself one of the top scorers for the Flyers if given an opportunity. As far a defense, the Flyers finally get Derian Hatcher's paycheck off the books and the only one left to get off the books is Mike Rathje, who has been in long-term injury for the past two years. The defense headed by Kimmo Timonen and Braydon Coburn stood pretty tall and should continue to grow, but will have to play a little more consistent in front of whomever is in net, as lapses at times have proven costly for the Flyers. There have been many questions about the future of coach John Stevens and what happens come October remains to be seen, but it should be a very busy off-season regardless of what is the final word in the "City of Brotherly Love." The buzz phrase for the 2009 Playoffs, aside from "Scrums after the whistle", may be "Intent to blow the whistle." That's a phrase I've heard way too much in the past week and two days since the playoffs have started. Apparently, this is a way to get the refs out of some hot water if they can't find the puck and it goes in the net. Quite frankly, this could be the silliest rule out there to date. I mean, if you intent to blow the whistle, if you intent to stop the play....you have a whistle, you have fluid motion in your elbow to move your arm from your side to your mouth-- blow the effin' whistle, it's not that hard. Maybe it's me being a little bit antsy when it comes to dealing with the drama of playoff hockey, as it is. Maybe it's the fact that this is an instant scape clause for the refs and that's a BS way to go about things, but they do it anyway. Maybe it was Memphis, maybe it was southern summer nights.....but enough Pam Tillis. The fact remains that this is something that should be looked at over the summer when it comes to rule changes. To be honest, I can see that it's effective only in terms of guys hacking at a goalie who has it covered for a few second prior, but in terms of reviewing a goal and maybe making or breaking a team who could have a chance to tie it up or put themselves ahead, it's a craptastic rule to have on the books. This rule has a chance of being like the puck over the glass in terms that it could turn the game on it's end and could cost a team dearly when all is said and done. I hope that it never has to get to that point, but you can almost imagine that it will take an incident and uproar for the NHL to actually give it some thought. Hell, we almost had that in Game Four of the St. Louis/Vancouver series, so that should be enough to bring it to the forefront. I'm just tired of hearing it as an excuse for refs, especially when it comes to reviewing plays that could have a meaningful connotation to it all. I mean, I definitely intend to hooking up with all the girls I flirt with, but sadly it never happens that way. If the ref intends to call a play dead, then they should do it or deal with the consequences when he didn't. Another award was announced to end out the week and it couldn't have been a WORSE award to announce heading into a weekend, the Lady Byng for most gentlemanly player in the league. This is what we have to linger over for the weekend. I'm sure it was a distinguished award when it was introduced, but as time and time went on, it got less and less relevant. Sean Leahy tweeted me the best thing, who want to be known as the most gentlemanly now?? It's basically who has the most playing time with the least amount of penalty minutes. So, instead of breaking it down, instead of boring you-- I'm going to hit the MP3 Player and give you a 15-song playlist that comes on, because that could be more entertaining than dissecting the Lady Byng. 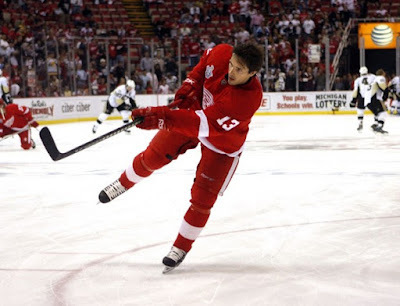 Oh, and I think that it'll be the fourth straight award for Pavel Datsyuk based on his point output and 22 PIMs. Though Martin St. Louis' 14 PIMs may make a run, but who cares-- really?? It has been quite the year for the Blue Jackets. It started with tragedy as founder and owner John McConnell passed on, but it ended with celebration as the Jackets made their first ever playoff appearance, albeit a short one, in the franchise's history. Along the way, they found a solid goaltender and maybe have served notice to the NHL that they are not the doormat they used to be. After being swept by the Cup champions, there's plenty to take away from the season and plenty to build on. Steve Mason's play is definitely one of the big things that the Jackets will be able to feed off of. While he didn't show it in the playoffs, the regular season play of Mason and trade of Pascal Leclaire has shown the Jackets have their franchise goaltender. No doubt, Mason should get the Calder Trophy, but he won't be the shocking figure he was this season. Not too many free agents to worry about for the Jackets, with Manny Malhotra and Jason Williams probably going to get re-signed and Michael Peca being let go by the wayside. Though, the Jackets impending problem will probably be getting a first-line center to accompany Rick Nash to have a nice one-two combo in Columbus. Expect a play for Mike Cammalleri in the summer, if the Flames don't re-sign him. Defensively, Jan Hedja, Fedor Tyutin, and Mike Commodore were solid this year, but were the only ones to play over 70 games on the backline, while Kris Russell and Marc Methot showed signs of improvement, but will need a little more PT before they solidly help the Jackets blue line for the long-term. The Jackets will also have to look for help in the area of secondary scoring to help Rick Nash. Nash was the only player with more than 60 points this season, while Kristian Huselius looked to be a bust after coming from Calgary, recording 10 less points than a year ago. However, you wonder how well someone like Antoine Vermette will do next season, as he scored 13 points in 17 games with the Jackets, which may mean bigger things for him in a full-season with Columbus. Sweep aside, it was a learning process for the Jackets and they will take a lot away from this season. Ken Hitchcock's message has been heard and translated into winning way for the Jackets, which have given the loyal fans in the C-bus something to truly cheer for. If nothing else, they can be proud of the effort put forth by everyone and should be looking forward to brighter days ahead in the Nationwide Arena. Mike Green, Zdeno Chara, and Nicklas Lidstrom were announced as the Norris Trophy candidates for the June 18th Awards in beautiful Las Vegas, where the slots are loose and the shrimp cocktails are 99 cents. Personally, despite the year he had offensively, Mike Green should not win this award on that merit alone. To say a sophomore, despite his offensive prowess and solid defensive play, is a better winner than two veterans who have offensive prowess, but are known for their amazing defensive play is putting the cart before the horse. Green will be a candidate for this award for years to come, I'm sure, but he may need to be taken down this year to motivate him a little more in terms of getting the well-rounded game rather than strictly known for his offensive play. If you're going to go for the true nature of the award as the best defenseman, you narrow it down to Chara and Lidstrom. Both of which have decent offensive numbers, but are spotlighted for defensive play and smart hockey prowess. Lidstrom could be the hands-on favorite again sheerly on his consistency as a player and his track record with this award as it is. Lidstrom had a third straight +30 and above year, a fourth straight 50+ point year, but may be showing his signs of age with his numbers dropping from the past few years. 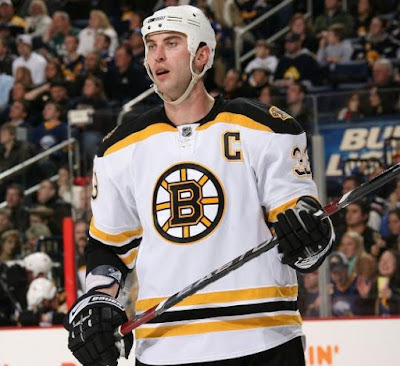 Personally, I think this could be Zdeno Chara's year. He's really stepped into a role as captain as a big time leaders for the East leading Bruins and didn't have too shabby of offensive numbers too boot. Chara could have been seen as overlooked in the past few seasons and may get his comeuppance this season with the Norris victory. It's about time that this imposing presense on the blue line get acknowledge by the voters as a solid force on defense and worthy of an award like this. A season filled with so much promise in their centennial year, the pomp and circumstance that had come with it turned into utter disarray and thoughts of what's going to happen in the off-season to get the glory they were supposed to get this year. There's several more questions regarding the Montreal Canadiens off the ice, but the on-ice product will deal with most of the scrutiny until something otherwise happens. Where did it all go wrong?? Did the injuries get the better of them?? Was the early lead in the standings only fuel to cockiness for the Habs players and made them lose sight of the prime objective?? Was there too much fun to be had for some of the youngsters on the roster?? Whatever it was, the collapse will bring about questions for the summer months ahead and make those wonder what can be done in order to right this historical ship. Obviously, what will happen in net is going to be a hot topic. Jaroslav Halak came on as a great fill-in for the oft-injury/sick Carey Price, but neither of them filled out and finalized the job. Which one will be the starter remains to be seen, but if Price is getting the job, he'll have to refocus on the task at hand; which seem to elude him this season. It's all going to start from net out and both of them will have to be solid in order to give this team any hope. A number of UFAs upfront will be questioned whether or not they'll be brought back, including Alex Tanguay and Saku Koivu, with the latter more likely to come back than the former. Tanguay will be depended on if he wants to stay with the club and if he thinks he'll get anything better from anywhere else. One thing is that Alex Kovalev won't be back for the Habs, as his major inconsistency was a downfall of the offensive production and made him fall out of grace with the team's brass and the fans, although they gave him much love at the All-Star Game. Another non-forward UFA, Mike Komisarek, should be back for the Habs next season to help anchor the defensive side of the puck. What will happen with the ownership is another burning question for the off-season. Whether or not George Gillett will sell and who will buy it is going to be debated back and forth, up and down. Many fans and pundits alike believe that as long as the team is kept competitive and marketable, it doesn't matter who is in charge, even Celine Dion. Mostly because with Dion, her Habs will go on. The fans will want the team to stay to its traditions regardless of who is going to be in charge and regardless of what is done with the team. So long as they are in the Cup hunt year after year, the fans will be appeased. The answer to the ownership question will be the answer to coaching/GM question that will face Bob Gainey if a new regime is put in place, and may be a question even if there is no new ownership. While Gainey may not get the guff he deserves, the fact remains he built this team and didn't address the problems when they first started to go downhill. It's obvious that there will be a coaching change, but whether or not it'll be Gainey's decision to appoint the new coach or not will be up in the air for the foreseeable future. The 101st year doesn't have the same mojo at the 100th year, but that's the breaks. The hype that came into the season didn't follow through after a quick start and the mapping of parade routes in November. Add all the off-ice debacles with night clubs, mafia connections, and coaching disputes-- it was a recipie for disaster in the second half of the season, coupled with the on-ice troubles due to injury, poor communication, and a lack of focus. Maybe instead of barberpole jersey, they'll have dalmation spots and bring more kids into the fold. The NHL announced the finalist for the Calder Memorial Trophy that recognizes the top rookie for the year. Steve Mason of Columbus, Bobby Ryan of Anaheim, and Kris Versteeg of Chicago are the finalist, but let's be honest-- it's Mason's. No slight on Ryan, who lead all rookies in goals (31) and points (57), or Versteeg, who was an early season favorite, but turned into a role player; but Mason was the story of the year for the rookies. Mason, from out of utter obscurity, became the reason why the Blue Jackets were able to get into their first playoffs in franchise history. With 33 wins, 10 shutouts, and a 2.29 GAA, Mason was nothing less than stellar when called upon by the Blue Jackets. Mason was a late-bloomer on all sorts of levels of hockey, but the fact of the matter is that he came on at the right time for the Jackets. With Pascal Leclaire going down to injury for the season and Freddy Norrena being released to make room for Mason in the first place, Mason went in with no pressure, no expectations, and that could have allowed him to play the way he did. As the attention grow onto him, he played up to it and not let the hype get to him. Maybe playing in a place like Columbus was the place for him in order to not get caught up in his own hype machine. The shock in this was the lack of rookies coming on during the second half of the season, though Ryan may be considered one in that camp, but nothing that was explosive enough to overshadow the feats that Mason put forth. Albeit, you'll have some people maybe putting up an arguement for Nashville's Pekka Rinne, who had 29 wins, seven shutouts, and a 2.38 GAA, but it is not to be in the Music City. Unless the voters totally turned on Mason for one reason or another, I doubt that he'll lose out on this award on June 18th. To think that this season was anything less than spectacular for the Blues is absurd. For a team that was supposed to be close to dead-last in the Western Conference by all accounts, they sure didn't play like it at all. The Blues played amazing when they needed to and grabbed the 6th seed after being 14th seed at the All-Star break and they can only grow from there. While the kids played tough under pressure, the playoffs were definitely a learning experience for this group and should help them build up for the season's to come. Lord knows they are ahead of the curve of learning and have done the fan base proud and surprising many of the naysayers out there. One of the questions for the next season will have to be if Chris Mason can keep up his stellar play. When he was handed the reigns in Nashville, he lost grip of it and was ousted from that gig very easily. If Mason is going to be able to keep the job and play as well as he did down the stretch, then the Blues should be in very good shape for the time when Marek Schwarz or Ben Bishop is ready to take over for the future. Another question is what this team could do with health on their side. With Paul Kariya and Andy McDonald lost for a good chunk of the season, you have to wonder how much better the Blues could have been with these vets on the ice to help the kids out more so. Though McDonald return in February gave the Blues a nice shot in the arm. Also, what will happen with Erik Johnson back after a golf mishap that we all know too well about and how much could he contribute to the young squads. Also, with the return of Eric Brewer next season, it should be a nice boost for the blue line. Much of the credit needs to go not only the players for growing up fast, but for the work of coach Andy Murray, president John Davidson, and the rest of the front office staff. Murray had a rough go about it in Los Angeles and struggled in his first season and a half with the Blues, but he was able to get across to the players this season and they responded, backing up their coach and buying into his message. 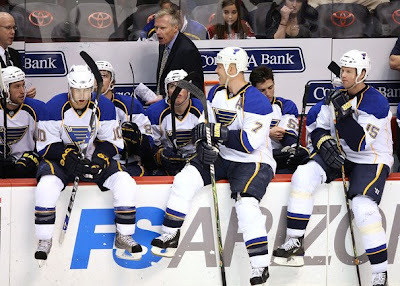 Davidson, who took the job in June '06, has brought pride back to a floundering franchise that the Blues were becoming. With the confidence from owner Dave Checketts and supporting GM Larry Pleau, Davidson may have added to his hockey career by being a successful executive, at least in the short-term. All in all, the Blues are much more ahead of schedule than any one had thought. With this experience for the younger kids, it'll only show them what they have to look forward to if they can keep playing the hardnosed, lunchpail game they bring to the table (which a touch of skill, may I add); they will succeed and go further as the years go along. It was my birthday and I was sitting in the Dalhousie Boston Pizza waiting on my appetizer when I saw the start of the Blue Jackets/Red Wings series on one of the screens to my left. As it started, the Jackets had a small feeling out process, but then put on the attack. With the barrage of shots taken, I was sure that the old Chris Osgood would show through and we could have a series on our hand. However, something caught my eye. It may have been just a glitch in the matrix, but when I saw Osgood go from post-to-post to get his glove on the puck in order to stop an early Jackets’ lead, I thought to myself, “He’s back.” I thought that Ozzy got his swagger back that I texted Marc “with a ‘c’” to tell him to watch out for Ozzy now. Sure, the fact remains it’s the Blue Jackets, who haven’t been the most offensively charged team in these playoffs, the fact remains that it may take a series with this against an inexperienced opponent to get the confidence back in a big way for Osgood and to get him to the point where he is the man to beat in these playoffs. Going 3-0 and only allowing two goals in those games shows that he has gotten his swagger back, and what better time than the playoffs. There has been plenty of questions brought about this season about the goaltending in Detroit, mostly because neither Osgood nor Ty Conklin have been consistently good. 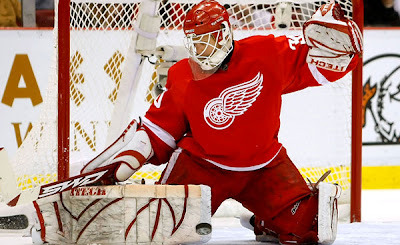 Sure, the Wings as a whole are an amazing team, but the fact remains that their Achilles’ heel is the goaltending and probably will be until Jimmy Howard, Thomas McCollum, or even Daniel Larsson are ready to step up and take the reins full time. Until then, Ozzy will be the guy in net and how can you argue with three Stanley Cup rings to his credit?? I mean, if ever there’s a spot you want playoff harden vets, it’s in net. And while the reliability factor may not be there in a regular season setting, odds are the playoffs and the do-or-die factor that brought up in the whole ordeal will bring out the best in even the worse player. Why do you think there’s always a guy no-one suspects at the top of the charts in scoring every playoffs?? Truer words have never been said. Great jorb, Hamstray—I mean…Osgood. I'll preface this by saying I respect Brad May and his playing abilities, I respect the tenure he has given to the NHL, and I think he's an upstanding citizen-- however, I'd liked to respectfully ask TSN to get Mr. May off the broadcasts, please. There's a certain type of player who is cut out for a broadcasting position when their careers are done. Most goaltenders are cut out for this (IE: Darren Pang, John Davidson, Chich Resch), as well as players who were big yappers on the ice (IE: Ray Ferraro, Nick Kypreos); but it seems that most of the agitators aren't very big on this whole concept. We saw that the Tie Domi experiment with TSN didn't go as planned, as he went from the desk at intermission to his own two minute segment pre-game, then went into oblivion...and I don't mean Sportsnet. It's hard to watch May out there on the broadcast because of the fact he was never into broadcasting schools or never seemed to be one for the whole big post-game quotable you'll find plastered all over the news. This was probably a chance given out by TSN and he just figured, "Ah, what the hell, how bad can it be??" When I watch him, it's very cringe inducing, especially when you figure that they probably told him right before he went out he'd be on-air to most of Canada and those with the Center Ice package and it make him look like a deer-in-headlights. Yet, unless you are used to that kind of broadcast pressure everyday, no one can be prepared for it and will probably freeze up, I know I would and I've been doing my amateur gig for almost eight years now (08.08.01 was our first show). And I while I envy the exposure that May is receiving, the thing I don't envy is that he has to go out there cold and try to be entertaining. I only did some public access TV and I was scared out of my gourd. It's not an easy thing to do and kudos to May for having the balls to do something like that, but know it's hard to watch at all times because he's out of his element. One thing I will say is that May is starting to turn a corner and get better with it all, trying to find his niche. If he can settle down before the end of the first round, then I may change my mind, but it could be time to cut his losses and maybe take a hack at it next year, much like a young, inexperienced playoff team would do after a quick exit. Definitely, the redeeming quality to all of this is that he hasn't pulled a Roger Millions type gaff. While two games does not a series make, you have to wonder what the mindset will be with these teams who are winless in their playoffs situations. While the Blues could be counted out since they are down 3-0, is there hope for other teams who are down 0-2. 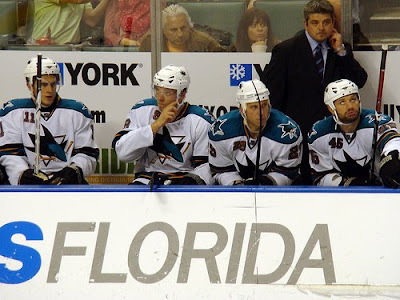 The biggest question mark could be with the San Jose Sharks. Albeit, I picked that upset special in my predictions; I didn't expect it to be this outright. While Jonas Hiller has been nothing less than spectacular for the Ducks, the lack of urgency from the Sharks is very disturbing. Plus, it looks like the tag of playoff-choker will never be off Joe Thornton if he can't take charge and lead the Sharks to victory. Not just on Thornton, guys like Patrick Marleau, Devin Setoguchi, and the rest of the supporting cast haven't been seen and we may want to put an APB out on them. If the Sharks bow out of the first round of the playoffs after winning the President's Trophy-- things will change, all around, I'm sure. Of the teams down 0-2, many people think the Flames will bust out of their slump when they return home. The thing with the Flames is that they played fine the first 20-30 minutes of the game, but then just seemed to lose all steam and motivation. While the "C of Red" will be a motivating factor, finding a way to have a healthy defense and having Miikka Kiprusoff handle rebounds much better than he has been will be the determining factor if the Flames can bounce back and head back to Chicago. 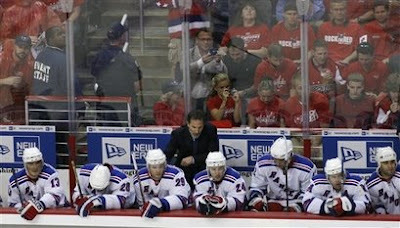 I don't think many people thought that the Rangers would be this tough on the Capitals, but believe it. Henrik Lundqvist is back and that could be scary for not just the Caps, but the Eastern Conference. Yet, the shot-blocking from the Rangers has been stellar and Alex Ovechkin has been doing way too much in order to get his team the W. If he can allow guys like Alex Semin and Niklas Backstrom do their thing, he'd be better off and may take control of the series by playing it low-key. Mike Green really needs to step up his game a little more on both sides of the puck, while Simeon Varlamov may have to take the reigns from here on out. The Canadiens and Blue Jackets are in deep. First, the Habs are just getting outclassed by the Bruins and their frustration is showing on the ice. All the scrums happening, it's getting into the heads of the Canadiens and has thrown them off their game. Even Saku Koivu is getting shaken up by it. Don't expect to see Carey Price the rest of the season, unless Jaroslav Halak gets injured or doesn't want to feel like a German prostitute anymore. Unless the Habs can focus on their own game, they'll be done soon. The Jackets are being taught a valuable lesson by the champion Red Wings and Steve Mason is looking like the rookie he actually is. Sure, this is the first playoff for most of the Jackets' stars, but you'd think that they would keep it a bit closer in terms of score and competitiveness. The one thing out of this series though is that Chris Osgood may have gotten his swagger back. If they go far and it's because of Osgood, the Jackets can say they gave him that confidence back to hoist another Cup. It's not beyond the realm of possibilites for these teams to comeback down 0-2, but with only about a 28% chance of them coming back, the odds are definitely not in their favor at all. The NHL Draft Lottery was held last night with the New York Islanders finally winning at something important and grabbed the first spot overall for the Draft this June in Montreal. What they will do with it seems to be somewhat obvious, but also somewhat up in the air if someone can sweeten the pot to the point they move the thing. 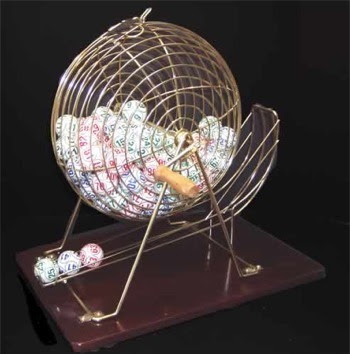 In any case, I'm going to look into my crystal ball to see if I can predict the outcome for the lottery picks. And by crystal ball I mean bottle of water......because I took some acid and I think this could only do good things for my prediction abilities. 1. NEW YORK ISLANDERS: John Tavares (London, OHL): Really, a no-brainer for the Isles since they have a decent amount of defensemen in their system and need some sureshot scorer in their line-up now. 2. TAMPA BAY LIGHTNING: Victor Hedman (MoDo, Sweden): The Bolts haven't had much luck with getting anything going on the blue line and with their wide array of forwards already signed, this could be the start forming something to help out their goaltending. 3. COLORADO AVALANCHE: Matt Duchene (Brampton, OHL): Duchene could be a spoiler and pop in the top-two, but the Avs will jump on him if he doesn't. He is a speedster and has the nose for the net. 4. ATLANTA THRASHERS: Evander Kane (Vancouver, WHL): A spunky forward who can be a scorer and ruffle a few feathers in order to get his team the advantage. 5. LOS ANGELES KINGS: Brayden Schenn (Brandon, WHL): Schenn has the skill set and passing ability to be the set-up man for the likes of Anze Kopitar and Dustin Brown and boost the scoring power for the young Kings. 6. PHOENIX COYOTES: Magnus Paajavi-Svensson (Timra, Sweden): There's plenty of hype with the speed and hands of MPS, but the only doubt is if he can consistently score game-in and game-out. 7. TORONTO MAPLE LEAFS: Jared Cowen (Spokane, WHL): If GM Brian Burke can't move up to one of the top two picks, he'll load up on another big defenseman in Cowen. While Cowen was injured, he can actually be a force and team up with Luke Schenn to be a solid duo on the blue line-- which will appease Princess Curl. 8. DALLAS STARS: Nazem Kadri (London, OHL): Kadri's stock was helped out by Tavares' acquisition, but his own skill set put him high in the chart before the thought of Tavares coming to London. 9. OTTAWA SENATORS: Oliver Ekman-Larsson (Leksands, Sweden): What's with the Swedes and the hypens?? Anyway, OEL will be another Swedish notch on the defensive prospects that the Sens are stockpiling away. With a +44 this season, his defensive responsibility will be a refresher after this season for Ottawa. 10. EDMONTON OILERS: Zack Kassian (Peterborough, OHL): Kassian is going to be a power forward and may be something that the Oilers will need to support the smaller skill players the Oilers have in their system right now. 11. NASHVILLE PREDATORS: Jordan Schroeder (Minnesota, NCAA): A small forward who can pick his spots from anywhere will give a shot in the arm to the Preds offense when their older vets, like Jason Arnott and Steve Sullivan, start to fade out. 12. MINNESOTA WILD: Ryan Ellis (Windsor, OHL): Ellis is a solid passing defenseman and could be an asset because his defensive prowess is just as good as his offensive awareness. 13. BUFFALO SABRES: Dmitri Kulikov (Drummondville, QMJHL): Kulikov will be a play-making defenseman for any team, which would suit the Sabres well if they start to go to a more offensive style of play. 14. FLORIDA PANTHERS: John Moore (Chicago, USHL): Moore is said to be the most solid skater in this entire draft, but his defensive reliability could be questioned, even though his offensive sense is on the high side of the chart. So that's that for now, and these could change with the tides and the trades that could come from all of this. We'll have to see where this is going to go and I'll have a full sheet as soon as the season is over--huzzah. Alright, so the East we set and now-- it's time for the West. It's simple geography, people. The Sharks had a helluva season under new head coach Todd McLellan and won themselves a President's Trophy, which is all well and good, but they need to get the playoff monkey off their back. They haven't been past the second round since before the lockout and really haven't done much with the talent they have. 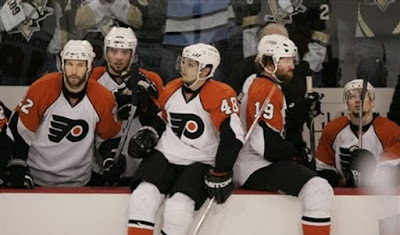 It will be interesting to see if the change behind the bench will chance the jinx in the playoffs. The Ducks, however, have had a rough year with injury, slothfulness, and woe, but turn it on during the last 15 games of the season and seem to be riding Jonas Hiller to the end. Even if he falters, J-S Giguere has a Cup ring for a reason. The one thing they will need to get is secondary scoring if their top guys in Corey Perry and Ryan Getzlaf are shut down. PREDICITION: Another upset special, Ducks in 7. I don't know what it is, but I don't think that the Sharks can get the monkey off their back. They seem to be a different animal in the playoffs, more like a guppy. However, the experience on the backline for the Ducks will shine through and shutdown anything the Sharks throw at them. The Jackets are probably one of the feel good stories of the year, finally making the playoffs for the first time, the season in which they lost their owner/founder. Steve Mason has played out of his mind, Rick Nash has grown into his own, and the supporting cast has been so quiet, it's hard to pick out which one will snipe you on any given night. The Red Wings have had a goalie problem from the start, but their offense has been something that has helped them. Pavel Datsyuk has had a breakout year, while Henrik Zetterberg has been steady through the season. While Nicklas Lidstrom hasn't been at his best, you can never think he has lost his stride. Playoff powerhouse Johan Franzen and his new 11-year deal will be definitely one guy to look out for. PREDICITION: Red Wings in 5. I don't care how bad the goaltending for Detroit or how great a story the Jackets have been, I'm sorry-- you don't bet against the champs. Another feel good story is the St. Louis Blues rise back to relevance with a huge run at the end of the season and it has sparked the bandwagon effect thanks to the play of T.J. Oshie, Brad Boyes, and rest of the cast of characters. This team also validates John Davidson as a solid executive for making this team as it is through youth and a sprinkle of veteran leadership. Also, look for Andy Murray to get some nods for the Adams Trophy. The main concern should be goaltending, but they seemed to have that solidified to make the playoffs. Goaltending won't be a concern for the Canucks, as they will be backed again by Roberto Luongo. Though he has some injury issues, the captain will be ready to get the Nucks back to championship form. With the Sedin twins firing on all cylinders and Mats Sundin in the fold, you'd be hard pressed to count out the Canucks slipping up in the first round. PREDICITION: As hard as it is, Canucks in 6. 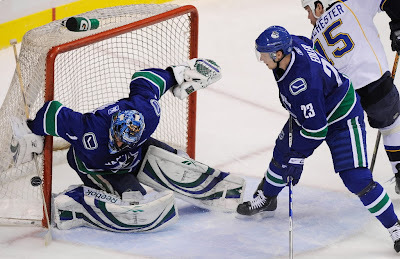 The Blues may be a great story, but I think he Canucks will be too much head-to-head for them and you really can't go against Luongo when it comes to going against the likes of Chris Mason. Yet another great story, all coming out of the Central Division, the Hawks have brought hockey back to Chicago and it couldn't come at a better time. The youth movement took a year to adjust and it's shining through in Jonathan Toews, Patrick Kane, the young defensive core, and let's not overlook Andrew Ladd, either. Having a Cup winning goalie won't hurt nor will having two experience keepers back there as options. The Flames will need to pick it up and hope they can beat the Hawks, which they have had difficulty doing in the recent past. While the pick-up of Olli Jokinen was decent, the team rested on their laurels and dropped sharply out of the Northwest Division top spot. Jarome Iginla and Mike Cammalleri have stepped it up and will be called out for the playoffs. The defense, however, needs to be a little tighter and participate in keeping the puck out, rather than joining the rush. This will also be a test on whether or not Miikka Kiprusoff was overworked this season. PREDICITION: Hawks will take it in six. There's only going to be one deep playoff team in Calgary and that's the WHL's Hitmen. 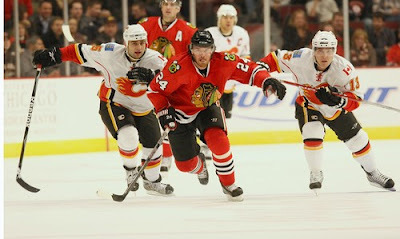 The Hawks have too much momentum and swagger, which will show against a beaten and worn-out Flames team. Well kids, it's that time of year again-- where boys become men and men become legends. That's right it's time for Burning Man.....wait, no-- the NHL Playoffs folks, that's what we're looking at here. Today, we're going from right-to-left on your atlas dials and starting with the Eastern Conference because....well, that's where the match-ups are set. The West set-up will be tomorrow or the next day. There are few rivalry games that's come to this match-up and really, how can you blame these two Adams Division rivals. Thirty-two times these two have met-up in the playoffs and the Habs have taken 24 of them, which includes the last three; the latest coming last year, in addition to the #8 over #1 upset special in 2002. While the Habs are very vulnerable right now, this could be a sign of a wounded dog with his number up and with nothing to lose. If their big guns can contribute in the clutch times, the Habs should be fine. That said, the big, bad Bruins are back and really have been a force to be reckoned with in the East this season. You can only bet they'll be out to silence the critics. The only question is how will they hold up if this is the start of a long playoff run?? While there's all the experience in the world in the regular season, some of these guys are very "green" in the playoffs, which may come into effect later on. PREDICTION: Upset special in this one, as I believe the Habs to take this in six. There's something about the Habs that have shown sign of greatness, but falling too short in the regular season. If there's a time for them to come through in the clutch and to shut up the Montreal media-- this is it. The Patrick Division rivals are back at it again, this time without Mike Liut or John Druce for the Caps to come out of the woodworks to steal some games. While Druce wouldn't be needed, Liut may get signed for the playoffs and Jose Theodore's game has come into question and has pundits saying that it's the only thing that the Caps have in terms of a liability. With his performance during the last game of the year, that may not be the worst question. Which Jose will come out and will Alex Ovechkin, Alex Semin, and the rest of the crew have enough offense to compensate. They'll have to do it against one of the premier goalies in Henrik Lundqvist, who may have not always been the top story, but always is a factor in most Rangers victories. Another quality for the Rangers is Sean Avery and what he'll do to get into the kitchen of Ovechkin and Theodore. The agitator could prove to be invaluable at this time of year for the Rangers, especially with an offense that has been somewhat less than spectacular. PREDICITION: Expect this to go the full seven to the Caps with Ovie winning his first playoff series on the fact he can score. The Rangers will need to catch lightning in a bottle if they hope to have consistent scoring for all around to counteract the Caps offensive prowess. The Hurricanes are the hottest team in the East to end out the season, but haven't looked that sharp the last few games of the season. Cam Ward has been a workhorse, which may be the best thing or a horrible situation for the Canes to wear out their young keeper. With Erik Cole back in the line-up, Eric Staal has found his scoring touch again. Could this team make another miraculous run to the Cup?? If so, they'll have to beat Martin Brodeur. Sure, after #552, Brodie hasn't been the top dog, but you can never count him out in a playoff situation. That's a given. Plus, with the new offensive force in Zach Parise, the Devils could make a big run and get a swagger after the first round that they have lost in the past couple of second-seasons. PREDICITION: Five games and it goes to the Devils. Don't get me wrong, I've been impressed by the Canes late run, but this is the Devils and after last playoffs' disappointment-- they have something to prove and quick. This could be their redemption series. The seedings haven't been finalized, but this series is another series of good old fashion hate. The battle of Pennsylvania will be one that also has some vengence on the Flyers side after the Eastern Conference finals last season. While the Flyers have gotten great offensive from Jeff Carter and Mike Richards, their goaltending has been very suspect. The choice between Martin Biron and Antero Niittymaki is really six-in-one; half-dozen-in-another. One of them will have to hit a hot streak in order to get the miracle win. Since the coaching change to Dan Byslma, the Penguins have gone from also-ran to pretty decent favorites. Since they are the Eastern Conference defending champs, there's something you can't discount about them. The pick-ups of Bill Guerin and Chris Kunitz has help take some heat off of Sidney Crosby and Evgeni Malkin. M-A Fleury has his time to shine now and will surely be under the microscope to prove last year wasn't a fluke. PREDICTION: Personally, I don't care who wins (since I hate both teams), as long as they batter each other to the point where it becomes the most entertaining series and drains them for the next round. Flyers in 7. Two goals, five assists, and minus-5 in 17 games played since the March 4th trade deadline. 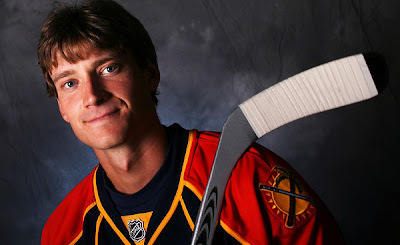 Those are the stats of Jay Bouwmeester of the Florida Panthers. With several rumors surrounding him leading up to the deadline, the Panthers held steady in hopes of a return to the playoffs. With those hopes dashed, you have to wonder if it was the right decision to make in the grand scheme of things. Especially now, with the Panthers out of it, the question remains if keeping their stud defenseman was worth it, considering it will take a lot to keep him in Florida come July 1st. Instead of getting something in return, they'll probably end up getting nothing from it all, unless they are able to make some sort of off-season blockbuster trade before the Free Agent Frenzy. Considering his stats, it may have been the wrong decision to keep him around, but at the same time-- you never know what one could do. With a change of scenary, Bouwmeester could have had a breakout second-half performance and make the Panther fans scream out in horror and question why they dealt him away. Damned if you do, damned if you don't-- I suppose. Considering it all, the Panthers should have continued their rebuild by trading away Bouwmeester at the deadline to get some solid prospects and maybe a couple draft picks. With Keaton Ellerby and Colby Robak progressing well in the Panthers' eyes, maybe it should have been the best decision to cut loose of Jay-Bo, but hindsight being what it is-- they may be too late to get anything for him now. Though it's not a sure thing that he can't be traded, odds are that the Panthers won't be able to unload him to anyone for anything substantal and the teams may just go into a bidding war rather than give up prospects or draft picks for Bouwmeester. That could be the death blow for the Panthers if they not only miss the playoffs, but get nothing for Bouwmeester in the end of this whole thing. But it's a gamble when you're a fringe team like they were; to give up a big piece of the puzzle in order to look towards next year and beyond or keep him and hope the momentum isn't lost so we can get him back for next year and beyond. It's going to be wait and see now if the Panthers can somehow lure Bouwmeester back into the fold, but the odds are strongly against them. They could look back and think of this as yet another fumble in their attempt to rebuild, but it's a risk trying to desperately make the playoffs like the Panthers were, especially when the support isn't there right now and may force them to move from the friendly Florida confines to somewhere else. On TSN's "The Reporters" this morning, Damien Cox brought up a point about fixing the draft lottery so that teams aren't tanking the season in order to get a better (which would be worse) positioning in the standings to get them a greater percentage of ping-pong balls in the good ol' Draft Lottery, which will be held April 14th. I assume this came up with the woes of the Avalanche, which Sean Leahy documents about all the injuries, and the Lightning shutting down Vinny Lecavalier, an indication of the team giving up and hoping to get another #1 pick (which I have said should be officially banned). Yet, is there a way to adequetely make a lottery system with the fair amount of weights so teams would be inclined to play hard from game one to game 82?? First, you could give the teams who came up just short of the playoffs a higher weight in it, reason being that if they had that superstar player, they could be in the playoffs and not have the ability to be in the lottery because they are focusing on the playoffs. That's not to say it would take the weight away from the last place team in the league, but instead of giving the second most ping-pong balls to the second to last team in the league; you give it to the team who finished 17th, who was maybe a point or two away from making it to the second season. Or you could keep the same weighted system, but pull the gimmick like they did after the lockout, taking out a ball for every 1st overall pick or playoff appearance or what-have-you in order weed out the really horrible teams from the teams who just had an off-year. Sure, it'd be harsh to a team like the Avalanche, but at the same time-- had they not had all those injuries, do you think they'd be in a high-lottery position or be one of the team either just in the playoffs or just out of the playoffs?? Finally, just get rid of the weighted system and go one ping-pong ball for each team and let lady luck fall where it may. You put the 14 teams who didn't make it into a hat, pull it them out one-by-one, and the last one in there gets the first overall pick. Not the fairest way to do it, but the most random. There has to be some kind of way in order to fix things with the Draft. Obviously, the worse teams should be able to be given priority on one of the top picks, but it's hard to determine who is tanking for the sake of tanking or tanking for the fact they are an absolutely horrible team. It's all subjective at that point and there's no real point to accuse someone of tanking when they are basically their roster is two steps up from a SPHL team. Some method has to work and I'm sure in my lifetime, something will happen to fix it all.....or not. With the Blackhawks reaching the playoffs for the first time in seven years and the Columbus Blue Jackets on the verge of making their first playoffs ever, and the St. Louis Blues making a magical run to the playoffs; it makes you wonder if making the second-season is enough for teams of that ilk. Does the small victory of actually getting to the dance enough or does success in the dance make the entire season?? For the Blackhawks, their rise from rags to riches is one of legends and goes to show that there's always a silver lining to dark clouds. With the success thus far, the team will be looked at to do some kind of damage in the playoffs. Yet, should big things be expected out of them?? This is a team full of great young talent, but to expect a lot out of them in an unknown territory may be a bit of a reach. Granted, what they don't know about the second-season may make them dangerous because they have nothing to lose due to the fact they weren't supposed to be there in the first place. The same could be said about the Jackets, as they were not meant to do much of anything. Thanks to the play of Steve Mason and the maturity of the team on the fly, here's a team who could be looked at as a dangerous dark horse. Rick Nash will have plenty of weigh on his shoulders to carry the team offensively, but they have made big strides in the short time they've had to adjust into a playoff contender. Should the Blues make it, they are another team who is young and don't know any better, which could prove them to be a dangerous team. But the love for TJ Oshie and the rest of the Blues could prove to make them the loveable dark horse in the playoffs, if they get there. But, does the success falter for these teams if they pull an Atlanta Thrashers and get swept out of the playoffs?? Would all of this success making the dance be in vein can they not get out of the first round?? I don't think it's true, especially in the case of the Blues or the Jackets, but more will be looked at for the Hawks to succeed if they can get the home ice advantage seed. Alone these stories are successful for showing how building from within can change a team in a short amount of time. The sign of youth ruling over experience is something that has been taking shape in the past few years of the playoffs with the success of previous teams who were led by youth. If they don't win a series, but don't get blown out, shouldn't give these teams any less merit for making the playoffs, since many of these teams were not giving the afterthought of making the playoffs this season. There has been a changing of the guard in the way the game has been played since the lockout, so why not a changing of the guard in terms of who dominates the playoffs. Once, where veteran leadership and being there before could be worth it's weight in gold, it may seem now that the teams that are the most dangerous are the ones with no experience whatsoever. With nothing to lose and everything to gain, you have to wonder if being the playoffs before and knowing the pressure is something of a hinderance now than it has been in the past. For the most part, stocking up on veterans could be a great choice, but now-- with the energy level the youngsters bring to the game, it may be a time to see what they can actually do when the pressures on and see if they can actually feel any pressure at all towards it. This also shows that the Central Division is becoming the cream of the crop of the NHL. Once, a laughingstock outside of Detroit, it shows now that anyone in that division could be deadly with two teams already clinchings a spot, one team very close to clinching and the other two doing battle for the 8th spot.